As you are probably aware, Paul Walker recently passed away in a horrible car crash. Personally, I haven’t seen a lot of his stuff, so the event didn’t affect me as it did many of you. I considered him, at the risk of sounding harsh, a typecast that only made films if he could be driving a car really fast. 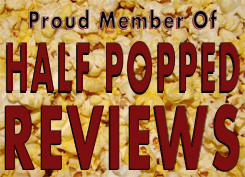 The only movie of his I have reviewed is Vehicle 19, and if you’ve seen my review, you’d see I didn’t review it very highly. Hours though, removed itself from that typecast position I initially held, and it had a really likeable and thrilling premise, so I got to give the man some kudos. This film centers on Walker’s character, Nolan, as he races against time and does everything imaginable to save his baby girl. 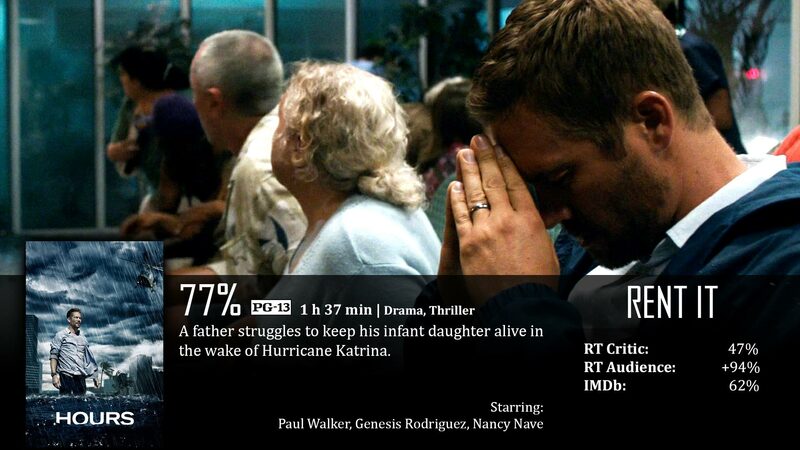 At the wake of Hurricane Katrina, Nolan and his wife rush to the hospital as she is about to give birth. Unfortunately, she dies giving birth to their daughter, Abbie. Abbie had trouble breathing though, so she was set up on a ventilator that helped her breath. When the storm cut out the hospital’s power, the hospital was evacuated, leaving only Nolan and his baby waiting for rescue that may or may not come. Every three minutes, Nolan had to turn a manual crank that recharged the machine keeping her alive, and every now and again, the timer subtracted a few minutes from the already short period of time. He had to keep his strength up, and remain awake as long as he could before he lost another person close to him. First of all, I want to say kudos to this premise. I don’t think I’ve actually seen any film centered on Hurricane Katrina, and I love the way they went about presenting it here, making the Hurricane itself really important without making it the center focus. Instead, this was about the raw affection of a father towards his daughter, doing the necessary, whatever that is, to keep his daughter (who he just met) alive. All odds are against him, as the film is littered with actual news footage showing the devastating reality of the aftermath, but he powers on, because that’s all he has left anyway. Hurrican Katrina was a setting, and because it was so huge in our nation, it also limited his ability to survive, which is realistic. If they were going for a reminder of the overwhelming reality of Katrina from a first-person basis, they did that. If they were going for showing how great of a man Paul Walker’s character is, they did that too. Honestly, as far as predictability goes, this film had very little. Hurricane Katrina was absolutely horrid, the film could easily wipe out this guy and his daughter if it wanted to because that would be just as realistic as them being rescued. If they died, I wouldn’t be surprised because that would just confirm our hatred towards the storm itself. Now…onto the harsh stuff…I’m sorry Paul, I wish I could say you’re a fabulous actor…but you’re not. You always seem to play great characters with a heart full of gold and always morally on track, but your acting could be better. I’m not saying he can’t act, I’ve seen a lot of stinkers, but he’s always fell below my radar. I’ll be honest, I want your character to succeed. The one thing that remains consistent in this film is that baby – I can’t imagine anyone watching this film that wouldn’t love the baby. That innocent defenseless child is what keeps this film so intact, and Nolan’s drive to keep her alive is more than admirable. It’s just those times when he, like, cries that doesn’t feel natural. When he’s sitting there talking to his daughter or the dog out of loneliness and feeling lost, that’s when his acting is good. I love the premise. I love the balance between covering the worst aspects of the hurricane while connecting that with a father’s love for his newborn daughter. I love the idea of a weak battery that he has to charge every three minutes – that heightens the level of suspense like nothing else. Finally, that baby. That tiny, innocent, defenseless baby makes watching this entire thing worth it. As much as I don’t want to say it, Paul Walker isn’t the best actor in the world when it comes to providing breathtaking emotional performances. He’s not the worst actor in the world, either, just…falls below my radar. He had to cry in different parts of the film, and I just didn’t buy it. Also, I didn’t get the relevance of all of the flashbacks…it just seemed to me like they wanted to make the film long enough…aka – filler. Nolan: I don’t get it. This wasn’t supposed to happen.